A Chicago Police Department sergeant who’s facing a one-year suspension over a falsified report that cleared a nephew of former Mayor Richard M. Daley of wrongdoing in the killing of David Koschman says the city waited too long to punish him, in violation of his union’s contract, and can’t discipline him now. Sgt. Samuel Cirone — one of six cops who faced firing or suspension over the handling of the Koschman investigation — is also asking a Cook County judge to stop the Chicago Police Board from hearing his case because an arbitrator has ruled that he has the authority to determine whether Cirone should be punished. The city’s law department plans to proceed with the police board case, saying the arbitrator has no authority to decide Cirone’s fate. The city also says the disciplinary investigation of Cirone was, in fact, done in a timely manner and didn’t violate the sergeants union’s contract. Cook County Circuit Judge Anna Helen Demacopoulos has scheduled a Dec. 30 hearing on Cirone’s motion to dismiss the police board case, which is set to come before the board on Oct. 18. After the police department closed the Koschman case in 2011 without filing charges against Daley nephew Richard J. “R.J.” Vanecko, Koschman’s mother convinced a Cook County judge to appoint a special prosecutor, Dan K. Webb, to reopen the case. Webb’s investigation led to Vanecko’s indictment, guilty plea to involuntary manslaughter and two-month jail sentence. Webb has said he considered filing criminal charges against Cirone and the five other cops but decided he didn’t have enough evidence to convict them. Instead, Mayor Rahm Emanuel and then-police Supt. 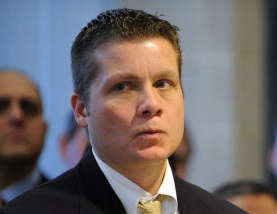 Garry McCarthy directed City Hall Inspector General Joseph Ferguson to determine whether the cops should be punished. Ferguson recommended the city fire Chief of Detectives Constantine “Dean” Andrews, Lt. Denis P. Walsh and Detective James Gilger and that the three others — Cirone, Cmdr. Joseph Salemme and Detective Nick Spanos — also face punishments and possibly firing over the Koschman case. But Andrews, Gilger, Salemme and Walsh retired before they could face punishment. Spanos and Cirone, who each got one-year suspensions, aren’t old enough to retire. Spanos served his suspension primarily by cashing in vacation time and unused compensatory time off. Cirone remains on the police payroll in an administrative position. The flap over Cirone’s suspension comes amid a U.S. Justice Department investigation over Chicago Police Department practices. The city’s disciplinary system for officers has come under fire for being too slow and for the fraction of complaints that result in disciplinary cases against cops.